We wish to thank our Sponsors, the Selection Committee and the Texas filmmakers that submitted films for this, our 19th annual Showcase. 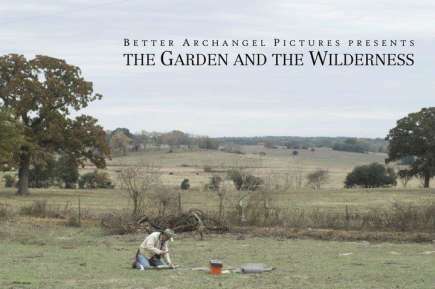 Since 1994 we've had the privilege of presenting Texas filmmakers and their exceptional work. The 2013 Showcase continues that tradition with six short films that represent the talent, creativity, and diversity that is Texas. For more information about the Showcase or about filming in Houston, please visit our website at houstonfilmcommission.com or give us a call at 713-437-5251. Two men sit down for a life-changing steak dinner in Omaha, Nebraska. Eric Steele most recently produced the feature film Pit Stop by Yen Tan, which premiered at the 2013 Sundance Film Festival, in addition to Wuss (2011) by Clay Liford, and The Verdigris.' In Search of Will Rogers (2013) by Beau Jennings. 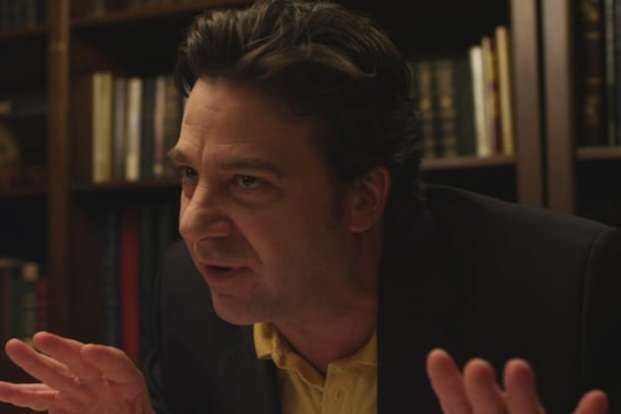 Steele has written and directed two feature films, Uncertain, TX (2011) and Bob Birdnow's Remarkable Tale of Human Survival and the Tianscendence of Self (2013) and is currently attached to Direct/Produce Casolaro, a feature film based on the true unsolved story of journalist Danny Casolaro who was found dead in a hotel room in 1991 after investigating a government conspiracy. Caliber Media and Aviation Cinemas are also attached to produce the project. Steele, based in Dallas, TX, is a founding partner of the Historic Texas Theatre in Oak Cliff, Texas and a Co-Founder of the Oak Cliff Film Festival. After 30 years spent caring for a Texas hunting estate, ranch hand Will James must confront the prospect of moving on from his life's work when he learns that the property will be sold following the owner's death. A final visit from the late owner's son offers Will a chance to reflect on his past, and to determine what to make of himself in the uncertain future that awaits his family. Craig Whitney premiered his first film, the Jewish-themed drama Harvest Home, in 2009. In addition to continuing his own film work, Whitney served in the production department of writer/director Terrence Ma|ick's Oscar-nominated feature, The 7i'ee of Life. In 2010, he directed and produced a concert video featuring Miranda Cosgrove of Nickelodeon's iCarly, and has also shot video for Natalie Maines’ first solo single Without You and The X Factor semi-finalists Emblem3. Whitney premiered his most recent film, The Garden and the Wilderness, at the 2011 Rome International Film Festival. Whitney is currently at work on his debut feature film, a family drama about violence along the US-Mexico border entitled Una Vela en el Entierro (A Candle in the Funeral), which begins filming in west Texas in 2014. All hell breaks loose when Petey is left with his hell rasing brothers. But things go from bad to really, really bad when dad comes home. Kat Candler's award winning films have screened at the Sundance Film Festival, Los Angeles Film Festival, San Francisco International Film Festival, Austin Film Festival, SXSW, Slamdance, Florida Film Festival, Museum of Fine Arts Houston, Chicago International Children's Film Festival, The National Institutes of Health, and on PBS. 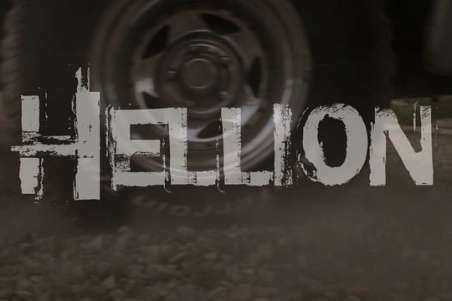 She's currently in development on the feature film Hellion, which was a Sundance Creative Producing Lab participant. Candler is also film Lecturer at the University of Texas at Austin. 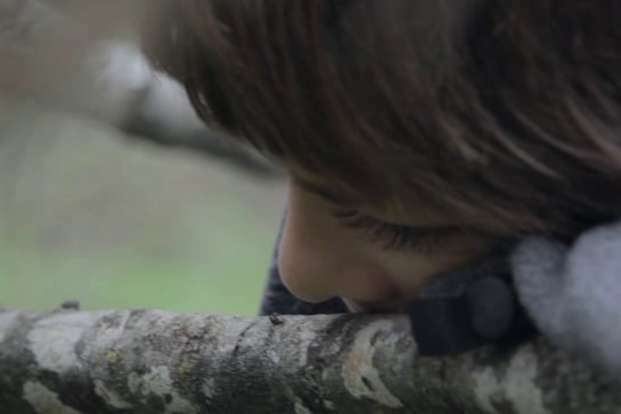 Cosmo spends his days roughhousing with his little brother and sister, and the games don't stop when he discovers an injured bird in their backyard. “Little Lions" is the story of Cosmo, a boy who's just starting to figure it out. Tony Costello is confident that time is the storyteller's greatest tool and he is interested in telling stories about characters as they exist in the moment. His work glimpses the sublime within human relationships through intimate portraitures of forgiveness between flawed characters. Tony has most recently worked as the Research Coordinator for Terrence Malick's forthcoming IMAX nature documentary, Voyage of Time. After earning undergraduate degrees in Philosophy and Political Science, Costello attended the School of the Art Institute of Chicago for a Postbacc program in Film, Video, & New Media, and then moved to Austin to pursue his MFA in Film Production at the University of Texas. Little Lions is his directorial debut. Two years in the making, this short documentary film captures the creative process of artist Vincent Valdez. Filmmakers Mark and Angela Walley followed Valdez as he created a series of works dedicated to his childhood best friend John Holt Jr., an Army combat medic who died in 2009 after serving in Iraq. Mark and Angela Walley are a husband and wife filmmaking duo based in San Antonio, Texas. Since 2009 they have produced over thirty short documentary films following the work of artists and non-profit arts organizations in Texas. Their films have been featured online at Roger Ebert's Journal, NPR Picture Show, The Atlantic, and Vimeo Staff Picks. Mark and Angela have also received film grants from Southwest Alternate Media Project, The Idea Fund, and San Antonio Artist Foundation to continue their collaborative work. In rapidly developing Western China, Sky Burial - a sacred ritual where the bodies of Tibetan dead are fed to wild griffon vultures - becomes a popular tourist attraction. Russell 0. Bush is a rural Alaskan turned filmmaker based in Austin, Texas. He works in narrative fiction, documentary, and wildlife filmmaking and has screened his work at SXSW, The Palm Springs lntl. Short Film Festival, AFI DOCS, and the Edinburgh International Film Festival. Russell is also a cinematographer who's worked in the comfort of the studio to waist deep snow in the Alaska Mountain Range with National Geographic Television's Untamed America series. 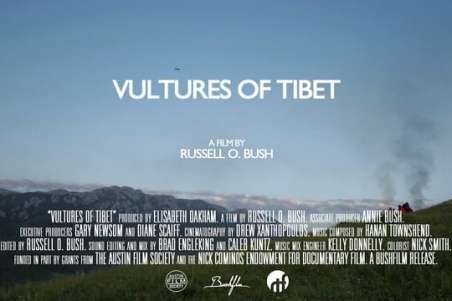 For Russell, Vultures of Tibet has drawn him in as a storyteller in its universal scope. Fascinated by myth, superstition, and obscurity as a place of discovery, Russell uses cinema as a tool to catalyze new understandings.